One of the great leaders of the republican movement and independence from Britain, Samuel Adams was born on this day in 1722 in Boston, MA. 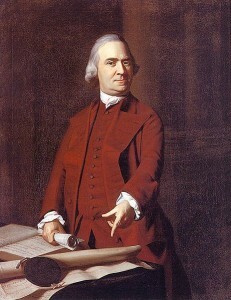 A Harvard man, Adams was was brewer, business man, tax collector and one of the greatest orators of his day. It was while serving as clerk of the Massachusetts Assembly, he proposed the idea of the Continental Congress, of which he later became a member of. He was a signer of the Declaration of Independence and the board that created the Massachusetts constitution. He was appointed Lieutenant Governor of the state in 1789 and five years later elected Governor of Massachusetts, a position he held until his retirement from public office in 1797. Adams died on October 2, 1803 in Boston at the age of 81. This entry was posted in American History, Boston Events, Boston Museum, Boston Tea Party, Boston Tea Party Facts. Bookmark the permalink.